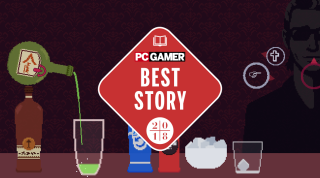 Next up in our GOTY awards is The Red Strings Club, from developer Deconstructeam. Find the complete list of awards here. Joanna: The Red Strings Club takes the grittiness of '80s cyberpunk and gives it a modern, corporate edge. But it does what every good cyberpunk story should do: make us question what it means to be human in a not too distant future. The Red Strings Club is all about the control of human emotion, whether that’s mixing drinks to make patrons more “loose” with information, or fulfilling the main quest of the story to stop Supercontinent’s Social Psyche Welfare program. As Donovan, all the detective work is done with old-school cunningness and charm, but with Brandeis’ it’s done through an implant that can precisely imitate voices. Arkasa-184 collects and synthesizes information about the bar patrons to quiz Donovan (aka you) on your listening skills. Your ability to discover key information about the high-level executives behind Social Psyche Welfare will determine your success in stopping the release of the program. Fighting large-scale cybernetic manipulation with small-scale chemical manipulation really brings out your inner hypocrite. When it came to mixing drinks for patrons, I had no problem choosing the right cocktail to get the result I wanted, but when it came to putting a Short Span Memory Resetter in people’s drinks, I couldn’t bring myself to do it. Sure, it would give me another chance to ask the same questions again in case I missed something, but it felt like I was drugging them without their knowledge, and that made me feel gross. I couldn’t cross that line of consent, even if it meant failing the main quest. Arkasa-184 fills the space between Q&A sessions with philosophical questions that confront you unexpectedly on your views of society and technology, morality, and free will. Prepared or not, you’ll learn something about your own views on transhumanism by (hopefully) putting some thought into these questions. Think about it: if you had the ability to get a cybernetic implant that suppressed every negative emotion you could possibly feel, would you? What broader implications would that have on not just your personal development but our society as a whole? The Red Strings Club asks you to grapple with these types of questions, and your answers to these questions that shape the future of this fictional world. Jody: I love a philosophical cyberpunk story and The Red Strings Club is great one of those, reaching way beyond "what if robots had feelings" to take on much less abstract themes. It's also a love story. The relationship between a bartender who can't leave his bar and a hacker who plays a mean piano is renegotiated and expanded on over the course of the game. It deals with that as maturely as it deals with the questions about free will and social responsibility and, yeah, what if a robot had feelings? What I'm saying is The Red Strings Club has a heart as well as a brain.